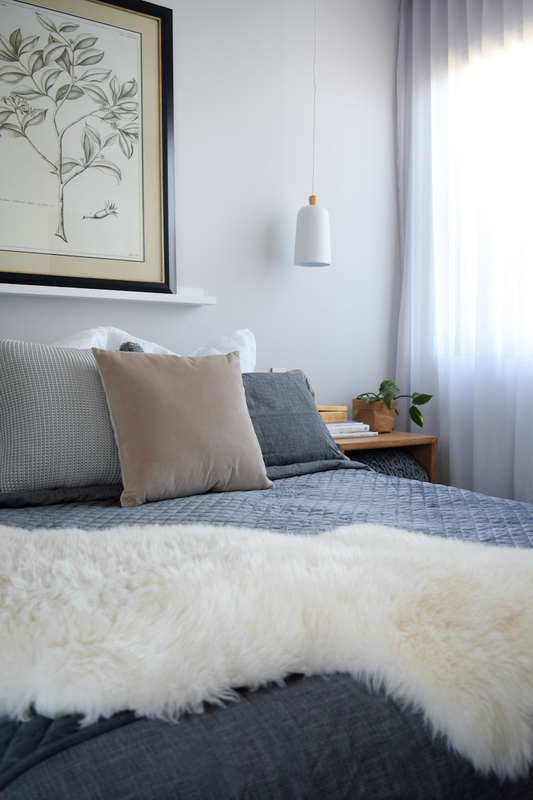 When the temperature drops, most of us naturally pull out extra blankets and switch to heavier bedding, but did you know there’s a lot more you can do to create a warmer feel in the home? Just like colours can affect our mood, so too can warmer interior styling help create a cosier feel in our homes. Here are 10 of our favourite ways to warm up your interiors! Mixing materials that are kept closely to their natural form such as timber, clay and textiles, will soften and add warmth to your interiors. 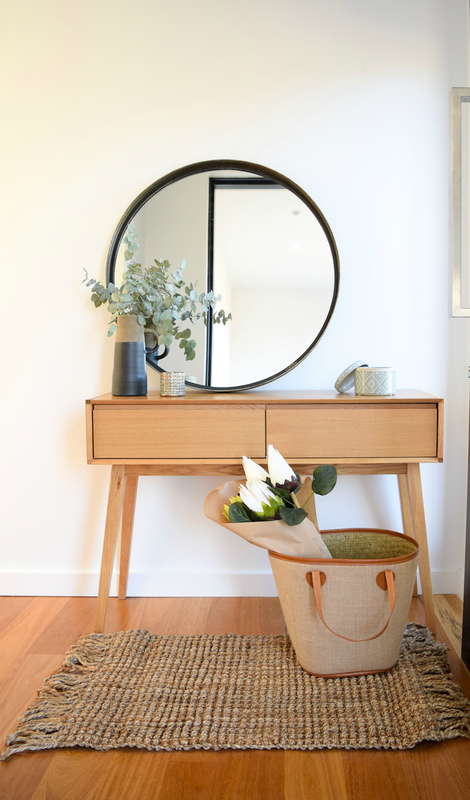 We used a jute mat from Freedom and a clay vase from Provincial to bring a connection to earth to this entry, and it instantly creates a welcoming feel. Dark and rich tones, such as deep grey or red wine tones for those who are a bit bolder with colour, are great choices to get you through the colder months. Lush greens and navy are also on-trend colour choices that offer a cosy, comforting feel. Pick one of these darker colours to set the scene in a room and consider adding a lighter accent such as cream tones or lighter greys, and a touch of a warm metallic to highlight and add contrast. While copper and brass were the ‘it’ metallic finishes of summer, this winter we’re seeing a shift to more brushed and aged metals. This large round mirror from Early Settler has an antiqued finish with beautiful darkening and tarnishing – nailing both the round mirror and aged metallic trends in one! 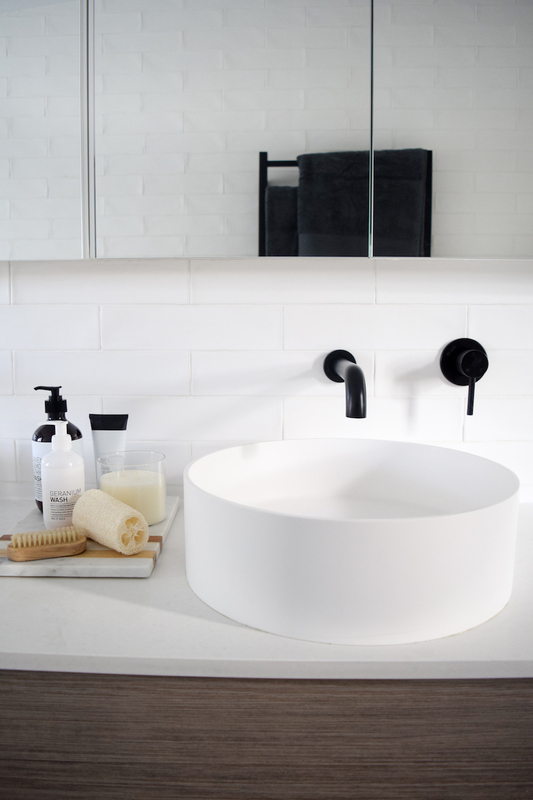 Generally the bathroom gets missed when we take our interiors from summer to winter but there are a few minor updates you can make in this space that will warm it up. Selecting towels in deeper tones, like these grey Freedom towels, and creating a small vignette using a candle in a wintery scent, products in pharmaceutical style bottles, and a few brushes or pops of natural materials, is all you need! Layering blankets and pillows on the bed, and throws and scatter cushions on the couch or occasional chair, will make these spaces appear and feel all the more cosy! 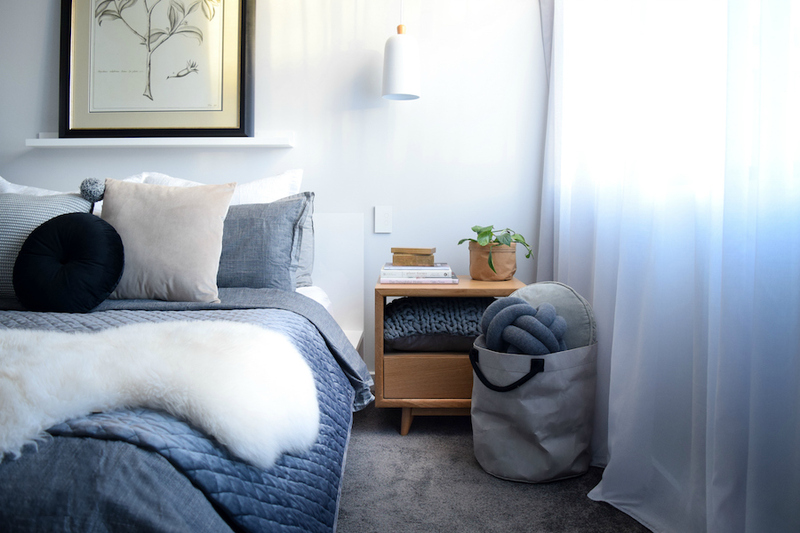 This season we’re seeing a resurgence of the velvet quilt and you can find loads of great buys at Canberra Outlet Centre in a range of colours and styles. You don’t have to stop at one throw on top of your bed — also teaming a sheepskin, hide or chunky knit throw will really make your bed look dreamy. We’re set to have one of the coldest winters in decades but rather than wallow, why not embrace the chill and create a cosy corner where you can sit at night with a good book and warm drink? Comfortable and stylish occasional chairs like this one from Focus On Furniture are becoming increasingly more affordable. Layer it with a throw, like this fun pom pom one from Adairs, and a cushion for added comfort. Finish the space with an on-trend side table (you can find this one at the newly opened Homemaker) and your winter retreat is ready! 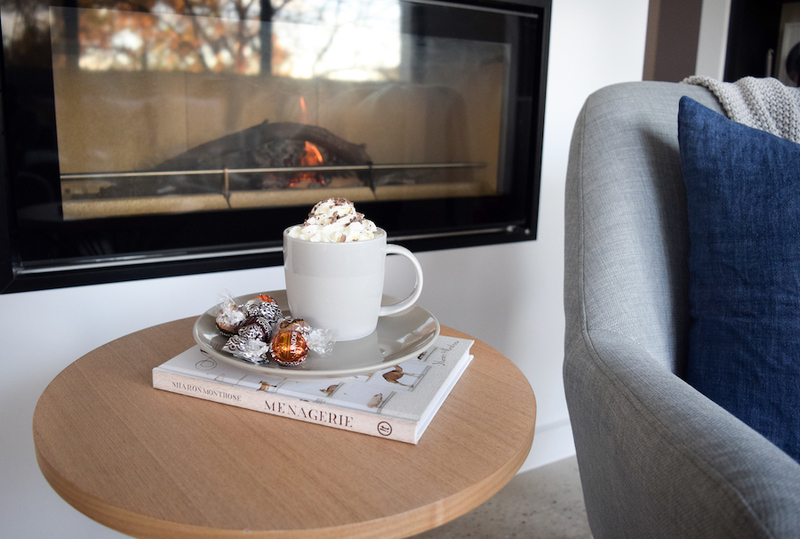 There’s nothing like enjoying a cup of hot chocolate next to the fire and if you feel like creating an extra decadent cup, you might like to check out this recipe topped with cream and chocolate flakes on the Lindt website. 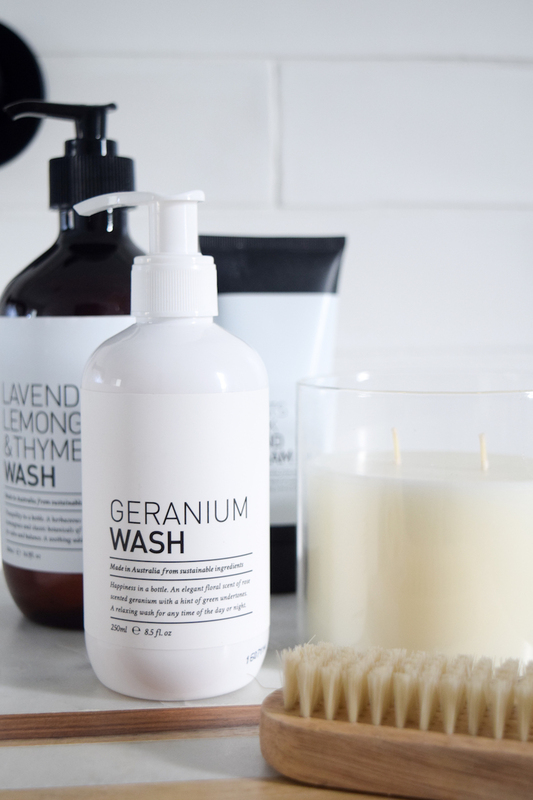 Styling your home for winter isn’t just about what we see – it’s also what we smell. Swap your summery candles, like lime and coconut, for those with a more wintery fragrance. Pick scents with spiced notes or natural essential oils. 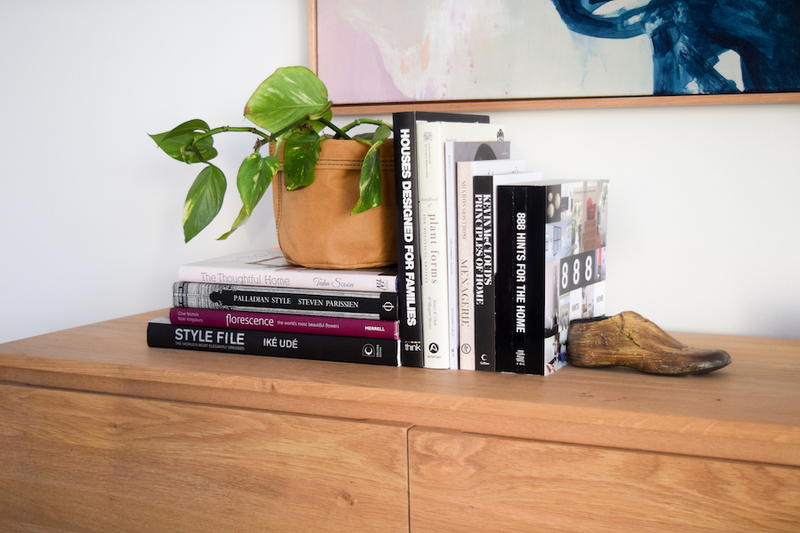 Books make a great styling prop all year round but especially in winter when you want to hint at curling up inside with a good book. A stack of 3 or more books looks great on its own or you can layer decorative items on top. For added interest, try stacking some books horizontally and others vertically. Branches are another way of bringing nature into our home. 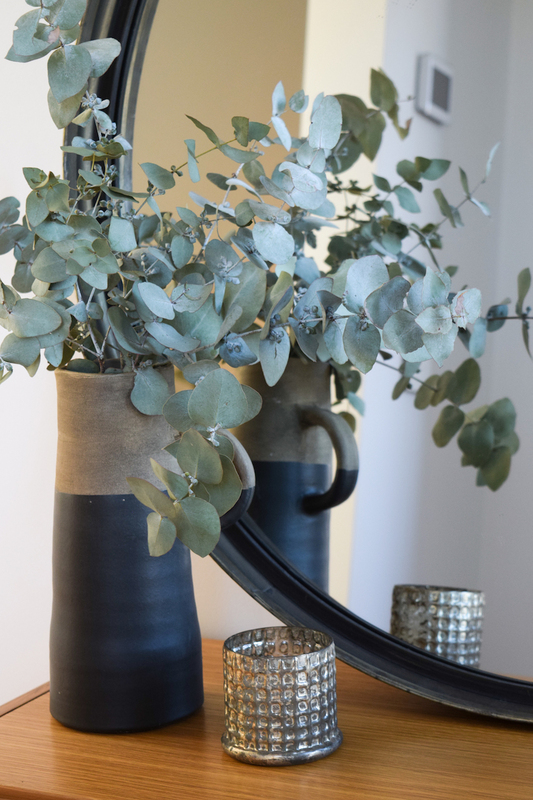 If foraging for branches doesn’t sound like your idea of fun, rest assured you can find a great selection of faux branches that are identical to the real thing. Freedom and Early Settler are just some of the stores where you can find Magnolia, Lambs Ear and Eucalyptus branches, just to name a few. Just when you thought you couldn’t layer any more items on your bed or couch, we’re suggesting you display even more! 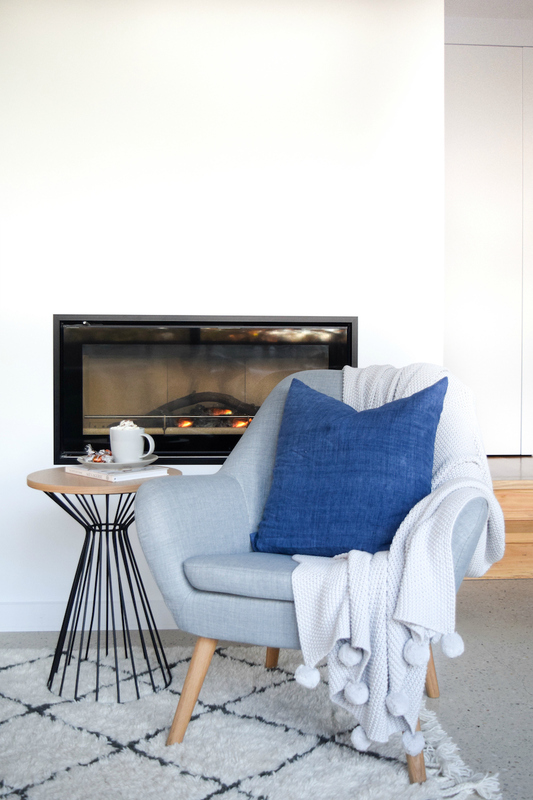 Using an open pocket of a side table or neatly folding a throw blanket on your couch are two easy ways you can create a cosier feel in your home. We hope these ideas have inspired you to bring some warmer styling to your home this season. 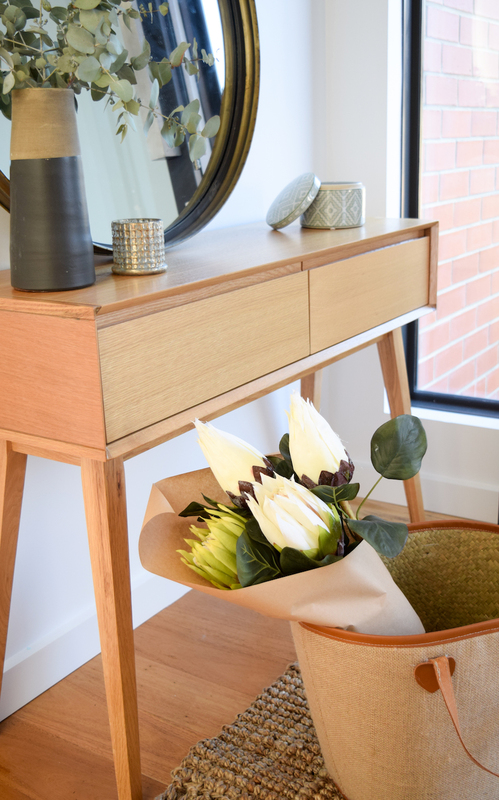 All of the items pictured are available at Canberra Outlet Centre who we collaborated with on this post. How do you like to make your home feel cosier over winter? Tell us in the comments below! 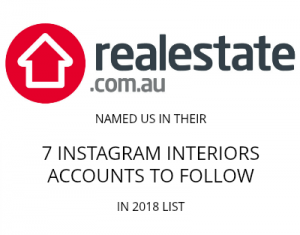 Hi Gina I love the white rug with the black diagonal lines – can you tell me where I can buy it?